StageBuzz.com: FRIGID New York Interview - Antonia Lassar of "Post Traumatic Super Delightful"
FRIGID New York Interview - Antonia Lassar of "Post Traumatic Super Delightful"
Post Traumatic Super Delightful is a one-woman, half clown, half monologue, all feminist critique of the sexual assault crisis on college campuses. It focuses on how there is no “good” survivor narrative, and how an entire community is hurt by sexual assault. Most of all, PTSD looks at what kind of role laughter can play when helping survivors and their communities heal. When I first came out as a survivor of sexual assault, I felt intense pressure to fit an identity that people expected of me. Trying to meet those expectations was incredibly painful. So I started to interview other survivors and was struck by how, while there is no single survivor narrative, everyone struggles under the expectation that there is one. I noticed that laughter was largely absent in most survivors’ healing processes. While every healing process is different, I do think that laughter’s overwhelming absence is a red flag. Laughter is a sign of acknowledging common humanity, of healing as a community. 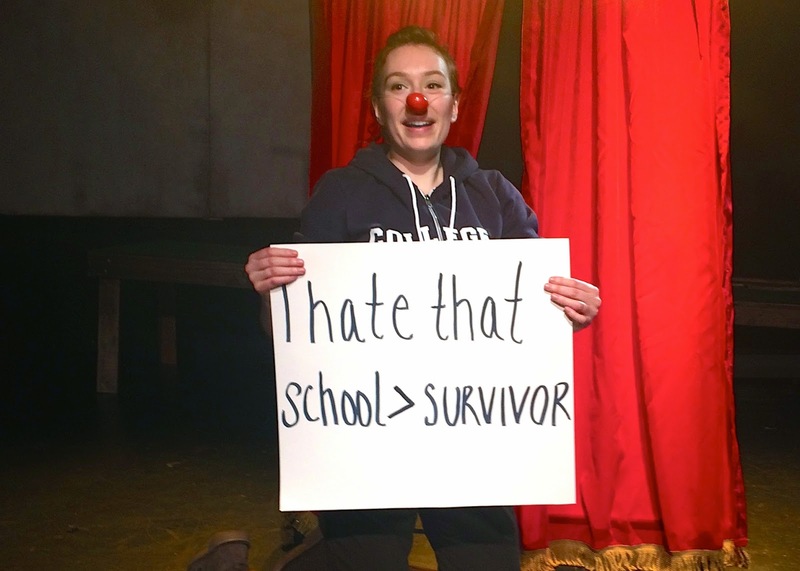 So because I’m a clown, I wanted to use theatrical clowning to experiment playfully with the absurdity of being a survivor. I have an ARMY! I am so proud to say that PTSD is produced by an entirely woman-identified legion of mini-Beyoncés! Angela Dumlao (Sea Wife) is directing; Kati Frazier (ART/NY, Random Access Theatre 2015) is dramaturging; Sam Garcia (Target Margin Theatre Lab) is both costume and set designing; Darielle Shandler (The Civilians) is light designing; Olivia Hull (New Dramatists) is stage managing; Lindsey Yadon (lindseyyadon.com) is graphic designing; and Molly Jones is our amazing production assistant! We want current college students at this play! PTSD brings up a discussion of sexual assault, consent, and college adjudication policies- a discussion every student needs to have! If you are a current college student, we really want you at the show! If you need help affording the ticket, please email us! I also would love to see an audience of survivors and their communities. Unfortunately, because sexual assault is so common, we are more than likely to have this without trying. We believe that laughing together as a community is a first step towards greater healing. I love the work of brilliant female solo performers before me! Sarah Jones, Anna Deavere Smith, Lily Tomlin. I also love the radical feminist reclamation of pop music happening right now with Beyoncé, Taylor Swift, Janelle Monae, and so many more. And Buffy. Buffy. Buffy. Buffy. Slaying vampires and the patriarchy. I have incredibly good information that “It Ain’t Going To Be Normal” is the best thing to ever hit the FRIGID ever. (I also might be in love with one half of the show.) I’m also really looking forward to another story of badass survivorhood from Gillian English in “Get Around Me”! My other one-woman show “God Box” (Frigid ‘13) is going to have a month long run at the New Repertory Theatre in Boston. And then PTSD is going on tour! We’ll be travelling to colleges and crisis centers nationwide! Favorite theatre professional? Meryl. Deal with it. I love her. Your best theatre experience? God Box is how I met my BF! Your worst theatre experience? Once my costume was only post it notes. Not even that many. Person you’d most like to thank for getting you where you are today? God! Barbra Streisand before I found God. For more information on Post Traumatic Super Delightful, visit the FRIGID New York website.